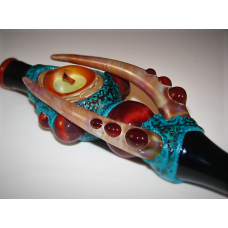 "Fang" is a beautiful collaboration between Kristian Merwin, and Shipwreck Glass. It features Kristian's unique style, including honeycombs, fully worked accent horns, and opals. It was handed off to Shipwreck Glass from Oregon, who applied a beautiful, blue patina, completing the project. This mouth piece is one of a kind, the item pictured is the one you will receive.